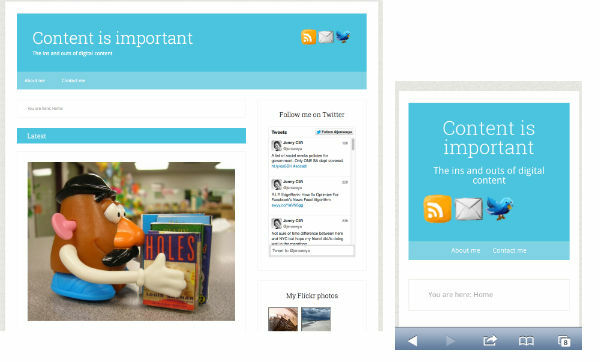 You are here: Home / Digital content / Are you responsive? It’s no secret that mobile devices like phones and tablets are used a lot more to view websites and to do tasks like shopping and banking. At a recent comedy event, Catch of the Day co-founder Leibovich saw some strangers in front of him use the Catch of the Day app on their phones. I’m guessing it was something these people probably wouldn’t have done otherwise, but because they had a bit of time while waiting for the show to start they got onto it. I’ve installed my bank’s app on my phone so I can pay bills and check my balance using my phone if I wish. It can be very handy and is quicker and easier to use sometimes rather than my desktop computer or laptop where I have to dig out my customer number to login. Using an app from my iPhone is fine because it’s built for the device but viewing a website that’s not built for a mobile device can be a very frustrating exercise in scrolling and zooming around the place to try and find the information I’m after. When I created this blog I paid for a premium Studiopress WordPress theme. I’ve been using free themes for years on other websites but I thought I’d pay for one this time. Unfortunately my knowledge of responsive web design wasn’t at top of mind when I purchased my theme and it wasn’t responsive. Responsive just means that it will look good when viewed on a desktop computer as well as a tablet and as well as a phone. But they’ve recently released an update which I’ve applied here so it is now responsive. The banner is a bit boring but all the content is there and it looks good on my phone and on my computer so I’m happy. And once I’ve got a bit of time I can tweak the banner anyway. I’ll also do a bit of tweaking with the CSS as I’m not mad keen on the fonts but that’s easy to change. Here’s a bit more about what responsive design is and techniques for achieving it. Here’s some lovely examples of responsive web design. How about your website. Is it responsive?